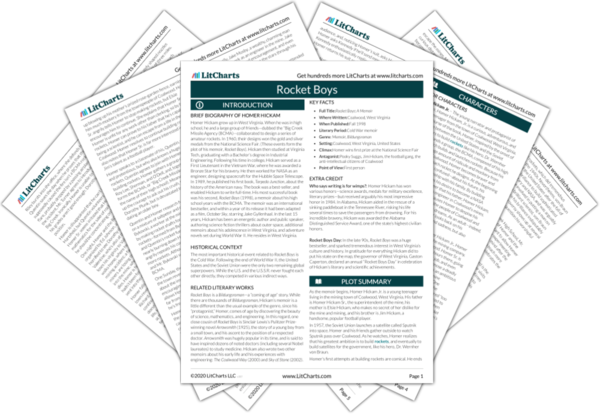 Instant downloads of all 942 LitChart PDFs (including Rocket Boys). 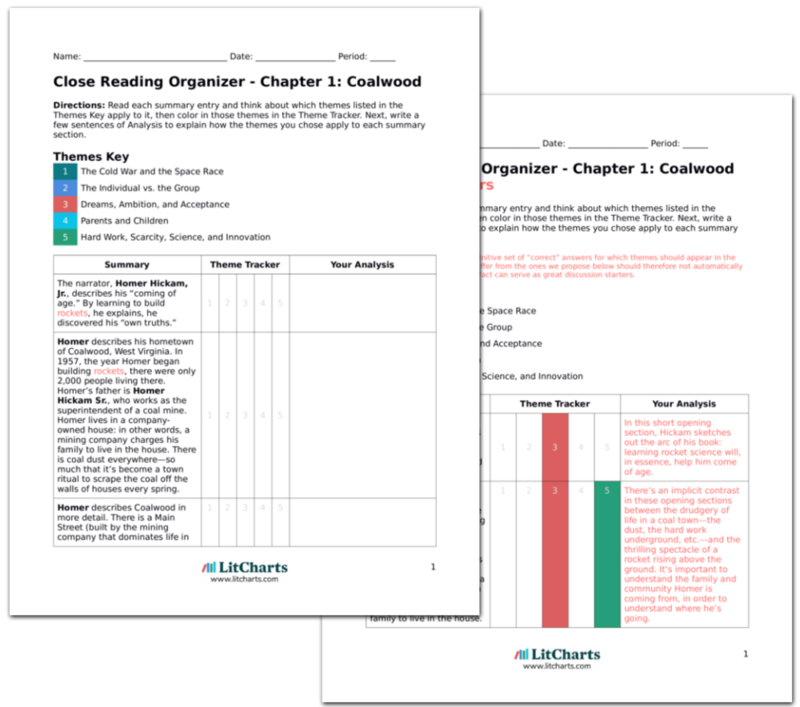 LitCharts assigns a color and icon to each theme in Rocket Boys, which you can use to track the themes throughout the work. Homer approaches Mr. Hartsfield, his math teacher, and asks him for help learning calculus. Hartsfield is dismissive at first—he reminds Homer that he couldn’t even make As in algebra. Homer admits that Hartsfield is right, though he points out that his friends—Quentin, O’Dell, Sherman, and Roy Lee, are all good math students. Hartsfield seems somewhat sympathetic to the BCMA’s goals of mastering rocketry, but he sadly explains that they’ll never succeed in lobbying for a calculus class—Big Creek is a mining and football school, not a calculus school. Homer and his friends find this wildly unfair, and Mr. Hartsfield admits they’re right. Even if Homer and his friends are getting more support in Coalwood now, they continue to run into difficulties when it comes to the logistics of building rockets. Here, they receive a sobering reminder that Coalwood isn’t seen as an intellectual place—the school board thinks of it as fit only for producing miners and football players. Even the teachers admit to Homer that this is highly unfair, but it seems there is little that can be done to change it. Aided by Miss Riley, the BCMA goes to talk to Mr. Turner about organizing a calculus class. Miss Riley is a forceful advocate for the boys, explaining that they’re very serious about calculus. Turner explains that he’ll need to speak to the superintendent, who will undoubtedly turn down the request. Afterwards, Homer notices that Miss Riley isn’t as cheerful as usual when she teaches chemistry. Miss Riley clearly devotes a tremendous amount of her energy and attention to helping her students succeed. When she faces an obstacle in starting a calculus class, she’s sad, maybe even sadder than Homer himself. The next day, Homer and Quentin are called to Mr. Turner’s office. There, they’re shocked to find Miss Riley and Mr. Turner standing with two West Virginia State police officers. The two men show Quentin and Homer a metal tube and demand to know if they recognize it. Homer tells the truth: the rocket isn’t one of his, though it’s beautifully designed. Turner and the officers refuse to believe Homer, and they tell him that the rocket in question caused a vast forest fire. The officers say that Homer and Quentin—along with the other BCMA members—are under arrest. This scene parallels the earlier scene in which Mr. Van Dyke accused Homer and his friends of being thieves, and threatened to send them to jail. As before, here the police officers’ anger and aggression seem entirely misplaced—if Homer denies his guilt, there’s no reason to arrest him (as surely there must be dozens of forest fires every year). Before the officers can handcuff Homer and Quentin, Mrs. Turner, Miss Riley protests that the boys can’t have caused the forest fire—their launchpad is too far away. Mr. Turner’s wife then bursts in, carrying a map of the surrounding area. Homer notices that Mr. Turner seems to be irritated with his wife for entering his office. Nevertheless, Mrs. Turner unfolds the map and asks Homer to show the officers where his launchpad is located. He points to the Cape Coalwood—more than ten miles away from the forest. Miss Riley interjects that Homer couldn’t possibly have started a fire from this distance. Suddenly, Quentin realizes that the metal tube is a flare, much like those in a book he read a few months ago. A local airplane must have dropped the flare into the forest, he concludes. Even now, when it seems that Homer and the BCMA will never be treated fairly, their allies rush to their side—and new allies (like Mrs. Turner) at that. Perhaps this suggests that the BCMA’s prestige and fame have spread to the point where more Coalwoodians support it than don’t. Comically, it’s Quentin’s own ingenuity—not Mrs. Turner or Miss Riley--that saves the BCMA for the time being. Quentin remains accurate and methodical even on the verge of being arrested. 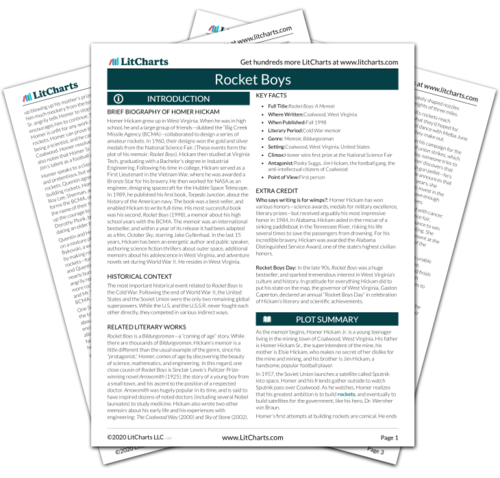 Get the entire Rocket Boys LitChart as a printable PDF. After Quentin finishes explaining the origins of the metal flare, there is an awkward silence. Mr. Turner clears his throat and asks the state troopers, along with Homer and Quentin, to leave. One week later, Mr. Turner summons the BCMA to his office and tells them that there will be a calculus class at Big Creek, with an enrollment of six students. Amazingly, Mr. Turner is so embarrassed about nearly arresting two of his own students that he gives in and organizes a calculus class. This suggests that he had more control over which classes are taught than he’d let on, and was at first just using the superintendent as an excuse. A few days later, Homer gets some depressing news: there were seven applicants for the six positions in Mr. Hartsfield’s calculus class, and because Homer’s grades are the worst of the six applicants, he’ll be unable to take the class. Homer learns from Mr. Turner that Dorothy Plunk took his place. While Homer is crushed by this news, he’s not angry with Dorothy—her grades are much better than his, and she’d already told him how much she wanted to learn calculus. Ironically, Homer can’t enroll in the class which he’s lobbied for so energetically, but he takes this depressing news with surprising maturity. In part, this is because the person taking his spot is Dorothy, his crush. But it’s also fair to say that Homer is becoming more mature: he recognizes that Dorothy deserves the position more than he does. A few days later, Homer and Quentin are standing together in Miss Riley’s class. Quentin offers to teach Homer calculus personally, insisting that Homer is still a part of the BCMA. Before Homer can reply, Miss Riley demonstrates a new chemical reaction: the combination of sulfur and zinc, resulting in sulfur dioxide. Quentin exclaims that they’ve found their next rocket fuel—rock candy will never propel a rocket beyond a few thousand feet into the air. Quentin proves that he’s a loyal friend, willing to do some extra work to ensure that Homer doesn’t fall behind the other members of the BCMA. In many ways, Quentin is a driving force behind the Rocket Boys: not only does he tutor Homer, but he’s also responsible for designing most of the rocket features, and pushing for more changes and improvements. The spring of 1959 begins, and Coalwood, thanks to extra orders from surrounding steel mills, works overtime to ship out coal. Unemployed miners regain their jobs, and the town as a whole becomes more prosperous. College football coaches also begin visiting the Hickam house to recruit Jim—much to his surprise, his suspension senior year hasn’t destroyed his chances of getting a sports scholarship. It comes as a pleasant surprise that Jim still gets to go to college on an athletic scholarship, especially after seemingly losing his chance because of his father. Jim may not be a particularly likable character, but it’s depressing to see him—the former pride of Coalwood—reduced to laziness and loneliness. Homer Sr. walks into his house, grinning—he’s just gotten news that Jim will be visited by dozens of college recruiters. Then he notices Homer looking glum, and Homer explains that he’s been cut from calculus class. Homer Sr. nods, but quickly moves on to talk to Jim. Angry and hurt, Homer goes upstairs to his room with Daisy Mae, his cat. He notices a book on a shelf in the hallway: Mathematics, a Guide for Self-Study. He leafs through it, noting chapters with writing in his father’s hand. He decides to teach himself calculus. The rivalry between Homer and Jim persists—at its heart, a rivalry for Homer Sr.’s affections. Homer Sr. had seemed to be showing more support for Homer lately, but now it seems as if all this progress was just because there were no football games in which to support Jim. Ironically, Homer Sr.’s indifference seems as powerful a motivator to Homer as his love and support. Arn, Jackson. "Rocket Boys Chapter 15: The State Troopers." LitCharts. LitCharts LLC, 20 Nov 2015. Web. 22 Apr 2019. Arn, Jackson. "Rocket Boys Chapter 15: The State Troopers." LitCharts LLC, November 20, 2015. Retrieved April 22, 2019. https://www.litcharts.com/lit/rocket-boys/chapter-15-the-state-troopers.